#BuySingLit is a nationwide initiative that will run from 9-11 March 2018 with more than 50 programmes spread across the island. Through buying and reading local works, you support the writers who bear witness to our lives, as well as the businesses in our community that deliver these stories to us. Most of all, you will experience the profound joy of unravelling the multi-faceted world around you. Volunteers will be required to commit to a minimum of 4-hour blocks a day. Volunteers will be allocated an event and time slot based on your availability. 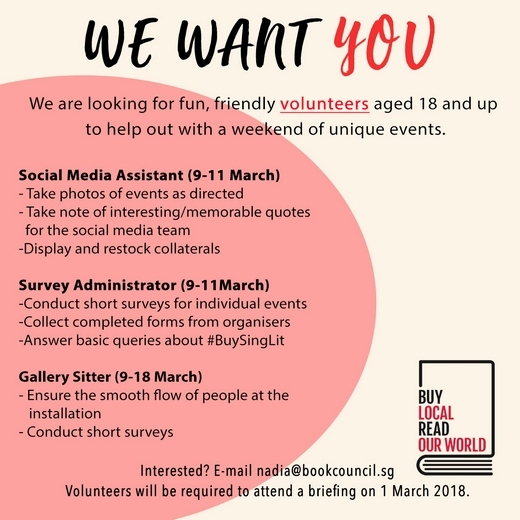 For every 4-hour block, volunteers will receive $20 worth of #BuySingLit book vouchers which you can redeem up till 31 August 2018. You will also receive water, snacks and a tote bag for your time. You may visit https://buysinglit.sg/ for more information on the movement and the programmes.